Party coming up soon, and still haven’t booked the entertainment? Can’t settle on a band to make your anniversary even more special? 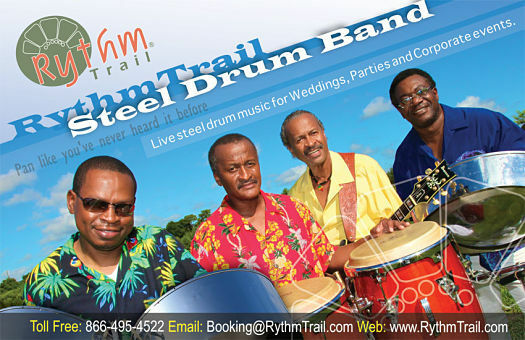 Leave the guesswork behind and book RythmTrail Caribbean steel drum band for your next event in Boca Raton. We specialize in any event you can think of, including beach weddings, corporate shindigs, birthday parties, house parties- you name it, we’ll play. Our steel drum players are all native Caribbean islanders, and we’ve been providing Boca Raton Florida and surrounding areas with our steel drum music for over 20 years. Take your event from ordinary to extraordinary with our steel drum, Calypso, Soca, and Reggae music. Hire our full band for big events, or even just one player if your needs designs aren’t as grand. Venues large and small, our band covers it all, and we’re one of the most experienced steel drum bands in the area. Need our top talent outside of Boca Raton? Our steel drum band plays all over the state of Florida, across the United States, and even internationally. You can count on RythmTrail, for wherever you go and whatever you need. Don’t gamble on the professionalism and skills of another band for your special day, especially when RythmTrail Steel Drum Band is just a phone call away. We’re equally at home playing upbeat music for your next house party as we are setting the tone to your romantic beach wedding. Take control with a customized playlist with all your favorite songs, or trust us to keep your event going strong. If you’re ready to be swept away by the sounds of the Caribbean at your next event, call us now at 866-495-4522 or get a free quote from us online. We’ll help you turn your next event into a day to remember, but hurry, because our schedule fills up fast! We wanted to extend a thank you for playing at our cocktail hour! Everyone enjoyed the steel drums; we received so many compliments! You were wonderful and we are so happy we chose you as one of our vendors! Best of luck with your company and many well wishes. We had our annual pool barbeque last Saturday at our community Mizner Court at Broken Sound in Boca Raton, Fl. The best decision we made was hiring the Steel Drum Band Rhythm Trail. Ephraim was fantastic and the residents loved the music. It added so much to our event and gave it such a great fun tropical feeling. At your next gathering, be sure to have them there, they are the cherry on top! We loved all the guys in the trio. They were on time, talented musicians and really tried to get our group moving on the dance floor. The carribean music gets everyone in a party mood. I would have them back in a heart beat and would highly recommend your band to anyone. Jammin in Boca Raton Florida tonight for a Christmas Party, the best in steel drum music. Our Steel Drum Band will be playing tonight in Boca Raton for a private New Years Eve house party. Hire the best steel drum players in Boca Raton FL for beach weddings, parties & corporate functions.